Posted by Lacey Hagler on Monday, November 12th, 2018 at 3:00pm. Mo and Sally from KOOL 105.5 will be aboard the Loggerhead Marina Grand Marshal Boat, and the big man himself- Santa Clause will be aboard the last boat of the parade. The Palm Beach Holiday Boat Parade benefits the U.S. Marine Reserves Toys for Tots Program and Little Smiles of South Florida. In 2017, the MIAPBC collected more than 11,000 toys for needy children in, making this event one of the top toy collecting events in Palm Beach County. View multiple toy drop-off locations HERE. 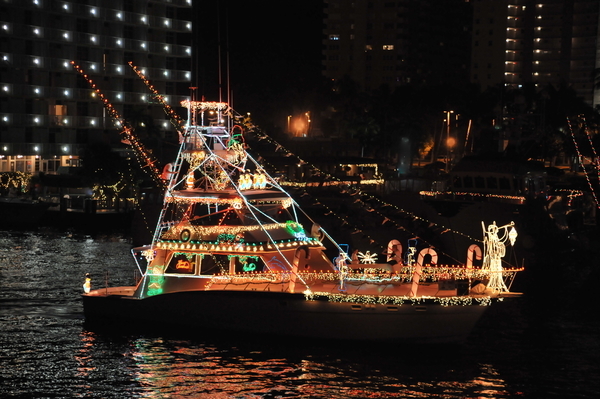 The Palm Beach Holiday Boat Parade will award over $10,000 in cash and prizes to multiple boats, including standouts in each size category, a “Best of Parade” winner, and a new social media contest. Boats of all sizes are welcome, and there is no entry fee required. Judging will be based on lights, enthusiasm, and themed décor. The best place to watch the parade is from the rooftop of Jupiter’s Harbourside Place, so this year they are generously hosting a Holiday Boat Parade Watch Party to benefit the AustinBlu Foundation. In case you’re not a Jupiter local, the AustinBlu Foundation is very close to our community’s hearts. The foundation was formed in the wake of a tragedy involving two young boys who were lost at sea on July 24th, 2015. Their love for the ocean reminds Jupiter boaters to take great joy in boating, but to respect the majesty of the sea by taking precautions to prevent this devastating accident from happening again. AustinBlu is dedicated to raising awareness, providing education, and promoting technology such as EPIRBs (emergency position-locating radio beacon) to promote boater safety. This exclusive event will run from 6:00PM until 9:00PM, and will include dinner and an open bar. Tickets are $150 per person, and can be purchased at www.austinblufoundation.org/shop. Space for this popular event is limited, so purchase your ticket soon! To allow parade vessels to pass freely through bridge openings, corresponding road closures are listed below. Due to weather, winds, tides and currents we cannot predict the EXACT time bridges along the parade route will be going up and down. Here are our best estimates based on past parades. Will open sometime between 6:00 and 6:15. Permit allows for a 1 hour opening. Will open sometime between 6:30 and 6:45. Permit allows for a 45 minute opening. Will open sometime between 7:15 and 7:30. Permit allows for a 45 minute opening. Will open sometime between 8:00 and 8:15. Permit allows for a 45 minute opening. Will open sometime between 8:15 and 8:30. Permit allows for a 45 minute opening. Featured photo is courtesy of Emilio Labrador.